I can’t be the only one who feels like this is what happens to my money whenever I go out to eat. 1. Avoid all the nasty stuff by making a Filet-O-Fish sandwich at home. 2. If you love Panera’s broccoli and cheddar soup (which, I mean, you do), here’s the recipe! 3. For those of you with a sense of humor and a serious craving for a homemade Taco Bell Quesalupa, check this out. 4. Caramel Frappuccino, anyone? Coming right up! 5. Everyone loves KFC’s fried chicken. Anyone who says they don’t is a liar. Make your own with a little help from a cool Australian guy! 6. Cozy Cones? Check. Waffles with Nutella? Check. 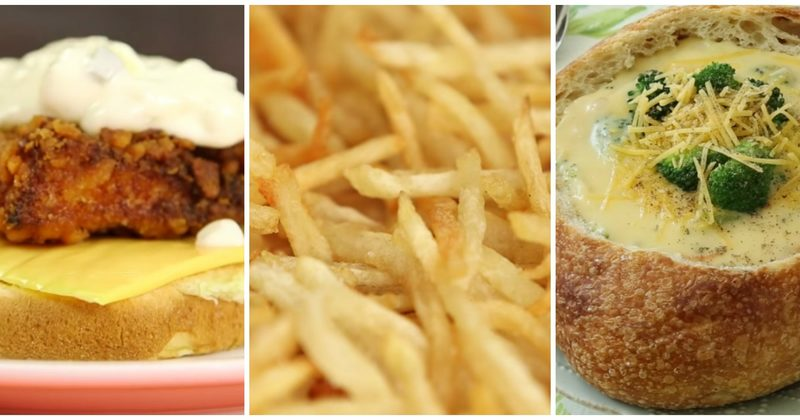 Here are a few Disney World and Disneyland food favorites! 7. If you think I’m not going to try this homemade Crunchwrap Supreme recipe, you’re out of your mind. 8. This Olive Garden Zuppa Toscana recipe looks like a winner. Buon appetito! 9. Enjoy a Chick-fil-A sandwich at home without a side of hateful political nonsense. 10. Go to a Disney-inspired food paradise with some DIY Dole Whip. 11. Wendy’s chili is cool and all, but why not make an entire vat of it at home for yourself? Be great, friends. 12. Whip up some sliceable happiness by recreating this Cheesecake Factory classic! 13. This saint of a woman will teach you how to make Red Lobster’s famous Cheddar Bay Biscuits. 14. Who says you can only destroy your health at White Castle? Make their sliders at home. 15. Live your best life and make your own Krispy Kreme donuts for a fraction of the cost. 16. Check out this recipe for McDonald’s fries. Bonus: They’re made by the cutest woman on the planet. 17. IKEA might not be considered a restaurant, but you know their Swedish meatballs are where it’s at. Go nuts and make 35,000 of them in your own kitchen. 18. If you love Shamrock Shakes, then this is the recipe for you. If you don’t, we probably can’t be friends. 19. I want to find the person who came up with Cracker Barrel’s famous Hashbrown Casserole and kiss them on the face. Until then, this recipe will do. 20. Do yourself a favor and bring a few more Cheesecake Factory avocado egg rolls into your life. Which ones will you try? As for me, I’m off to live my truth and make some Crunchwrap Supremes for lunch. Happy cooking!